Happy Friday y'all!! Boy am I SO happy its Friday, I'm leaving for NYC for a whole week tomorrow and I couldn't be more excited, I'm sad to leave Matt behind but it should be a fun trip! Today I have a total different look that I love from Aeropostale in their Bethany Mota line. She has some pretty cute stuff that I love! I love everything about this outfit though. 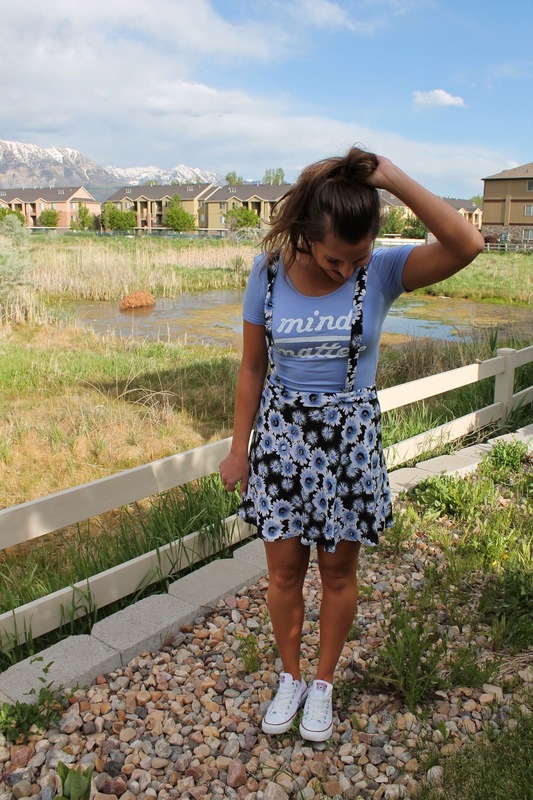 Overalls are making a comeback but I love that this is a different take on it, the overall skirt! Its so fun and spunky, and the pattern is super cute. I feel like it gives off a retro look, and how cute is the cropped top I paired it with? Such a clean and cool color plus the way the saying is designed on the top is pretty cool. And both these pieces together are under $50?! Its such a steal! I hope y'all have an amazing Memorial Day weekend!! Thanks for being such awesome readers!!! I love that skirt! So so cute...I need one.